And if I wanted them to appear about 10 times the size of the sun and moon, would this be possible? Should they lie inside LEO or beyond it? I would like their orbit to be considerably closer than the moon's orbit. How big would they have to be, and how far away? Would we be able to feel their gravitational pull? Thank you, new StackExchange friends. First: how big to appear as big as the moon if in a typical satellite orbit? 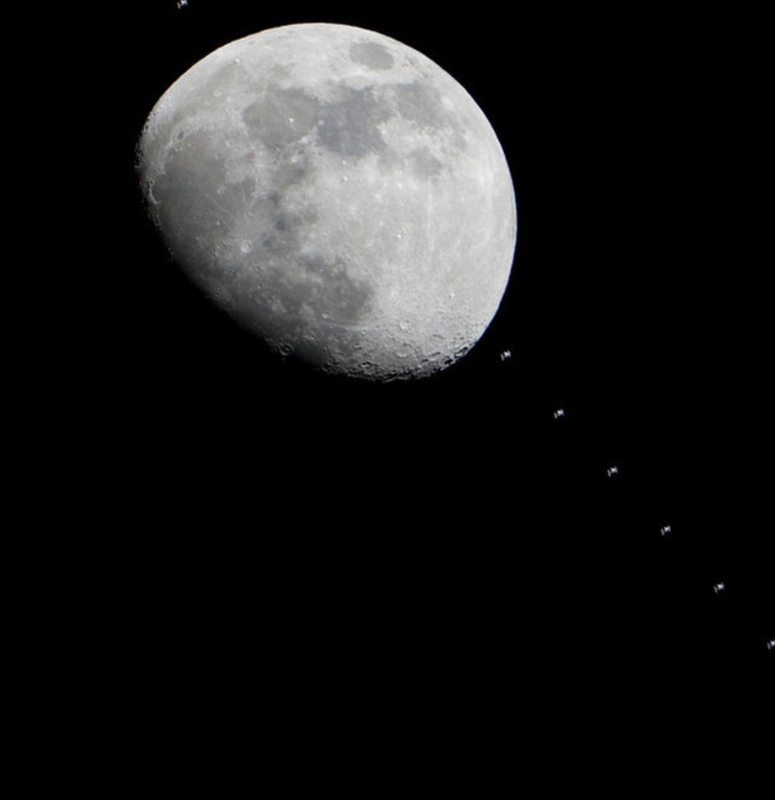 Here is a fine image of the ISS passing in front of the moon and we can use it to gauge their relative apparent sizes. When I blew them up, I measured the diameter of the moon at 567 pixels and the ISS at 14. 567/14 = 40 so a satellite 40 times the size of the ISS would be the size of the moon. If the ISS is 100 meters this moon-size-looking satellite will be 4000 meters. I found this excellent (but perplexing - what is this guy up to?) proposed solar shade which happens to be exactly 4 square km! 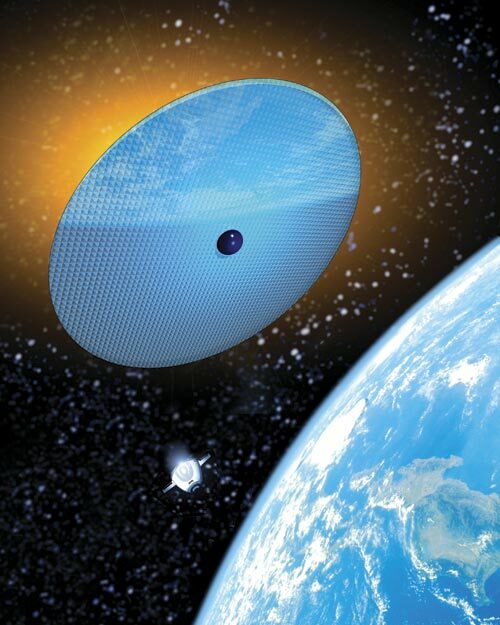 Space sunshades for power generation or earth cooling have been mooted since the 1980s. Yes, I meant to write "mooted", and mooted in all seriousness by serious people. The space sunshades were. 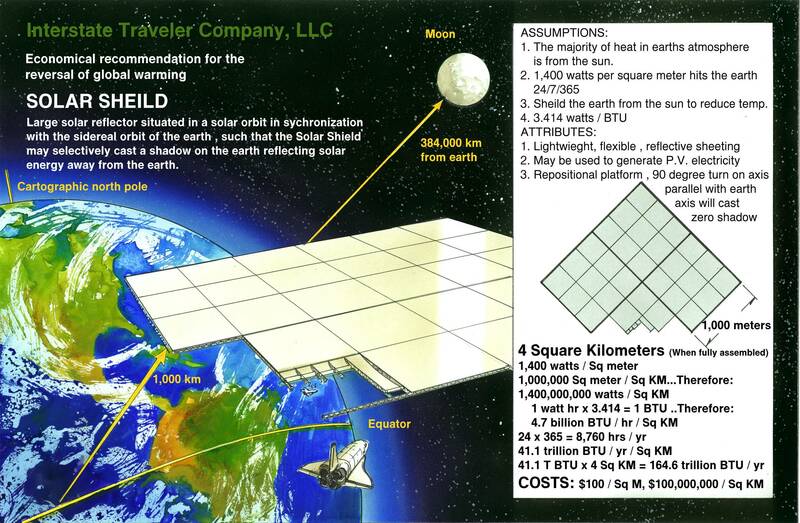 A 1992 NAS report suggested a slightly less extreme project, which would involve lofting 55 000 "solar sails" into orbit around the Earth, each with an area of 100 sq. km. These would block out about 1% of sunlight, but avoiding collisions would be a space-traffic controller's nightmare, warns Michael MacCracken of the Climate Institute in Washington, DC. 10 times the size of the moon? Bah. 25 times the size of the moon! 100 square km makes that 4 square km scheme look pathetic! And you will note: 55000 of them are proposed in this slightly less extreme project. If these are hooked up as a unit that is 5500000 square km or ONE MILLION 375 THOUSAND TIMES THE SIZE OF THE MOON. Muhahahaha! hmm. that seems big. What is the surface area of the Earth? 510,000,000 square km. OK, we're fine. So yes: superlarge satellites are a plausible, fine and desirable thing. Cool the earth, generate power, and show movies. For completeness sake: 1: How big would they have to be - we covered that. 2: How far away - we used the ISS as a reference point and it is 408 km up. 3: Would we be able to feel their gravitational pull - no, because these are wafer-thin satellites. The moon orbits at ~400,000 km satellites in lower Earth orbit ~ 400 km +. Anything that orbits in something other than a geo-stationary orbit should rise and set, albeit at a different rate to the Moon and Sun. So if by "like the Moon" you mean at the same rate then no, as that would require a vastly larger orbit (and thus a massive satellite); whilst LEO will give you a total orbit time in the order of an hour or two. At 20,000 km a satellite would make two full orbits a day. If it is orbiting in the same direction as earths spin, it would appear to an observer on earth to orbit once a day, rising in the west and setting in the east. The Earth - moon Roche limit is about 10,000km so you could just move the moon closer without worrying about tidal forces tearing it apart. From 400,000 km to 20,000 km is 20 times closer so it will appear 20 times larger. The effects on the tides will be noticeable and I would expect other noticeable side effects, but the actual pull of the moons gravity when overhead will still only be one tenth of a percent of a g, so we probably wouldn't be able to notice the change. A satellite in this orbit would need to be 23000 km^2 to match the moon in size. Borrowing from Wills answer, this size of solar panel / sun shade seems possible. This does not seem like the most practical orbit for this sort of project though. Is it possible for satellites to rise and set like the sun and moon? Yes it is if they are in the right orbit. Is it possible for a satellite to be ten times the size of the sun or the moon? No. Such large objects would destabilise the whole solar system. Is it possible for a satellite to appear to be ten times the size of the Sun or the Moon? Yes but it’s not realistic. The real problem is that to appear to be 10x the size of the Sun or Moon in a distant orbit they would have to be astronomically large, but to be small enough to be a manageable size they would have to be in far too low and fast an orbit, so they would move much faster than the Sun or the Moon. Worse still the orbit would be impossibly low and they would burn up in the atmosphere. Not the answer you're looking for? Browse other questions tagged science-based reality-check gravity orbital-mechanics climate-change or ask your own question. Is it possible to have a planetary system with planets having perfectly synchronized orbits? What mechanism could be used to create an eternal night? How to harness Jupiter's gravitational energy? Can one or multiple moon(s) pull the sea around my planet? 160 Year Solar Orbital Period & 1.9 Year Moon Orbital Period - Is it possible?